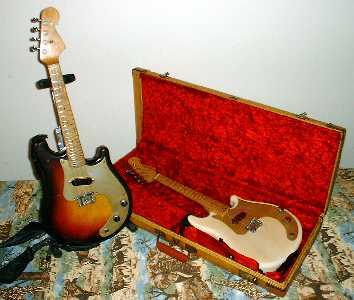 A multi-instrumentalist and orchestra conductor who has toured the world as bandleader for Cirque du Soleil's "Quidam" tour, plays two Fender Mandocasters (pictured below). Check out his Web site. He writes: "I bring my '57 sunburst on the road with me, and go to open mic jams whenever possible. 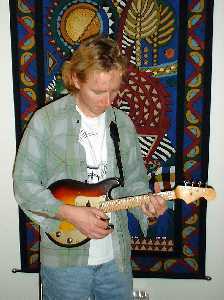 My mandocaster-based quartet, Mad Nomad, will be releasing its first CD, Celtic Bebop, when I finish tinkering with it." "Dance of My, Uh ..."